Saturday night saw the first ever cinema screening at the Big Park with an alfresco showing of ‘The Italian Job’. The entire film was run on pedal power, and a group of very motivated and energetic volunteers kept the film going for over 90 minutes! We’re sure that the racing Minis kept their andrenelin pumping! The park was also blessed with a dry, starry night and 300 paper lanterns illuminated the paths – the park is truly magical at night with the silhouette of the giant, acorn tower and totem gateways against the skyline. Michael Caine’s voice booming out across the South Downs was quite surreal, but it all added to the novelty and fun of the evening. We’d like to thank the South Downs National Park, Electric Pedals, Sustrans, Cycleseahaven and everyone else who helped make the film such a success and for creating a virtually car free event. 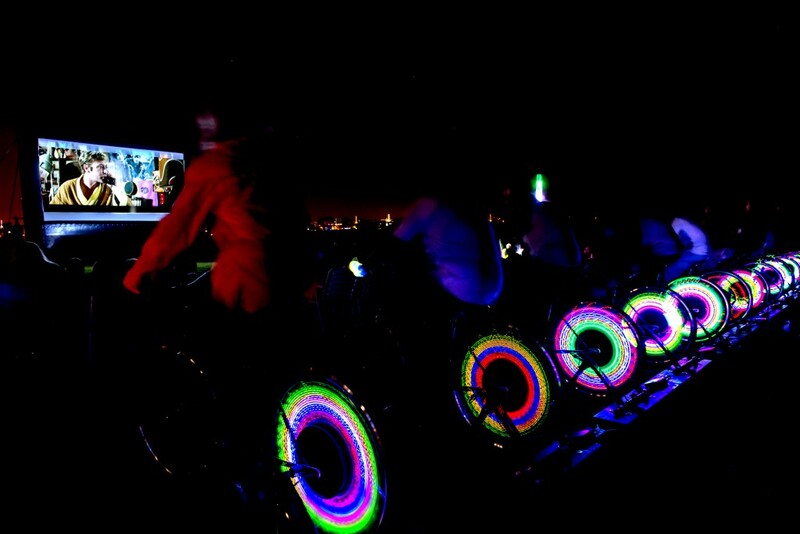 Don’t forget to keep an eye on Twitter and our events page for more rides and activities in the near future. See you next time.